TCM and Fathom Events are bringing Double Indemnity starring Fred MacMurray and Barbara Stanwyck to movie screens across the US on July 19 and 20. If you haven't seen it, you're in for a rare treat; if you have, now is a great time to revisit this film noir classic. This article features vintage ads from Double Indemnity's original run. Film noir was still in its early stages when director Billy Wilder's Double Indemnity was released in September 1944. There had been a smattering of noirs like The Maltese Falcon (1941) and The Letter (1940), but Double Indemnity, with its voice-over narration, shadowy cinematography, and dark story filled with murder and deceit set the template for many postwar noirs. 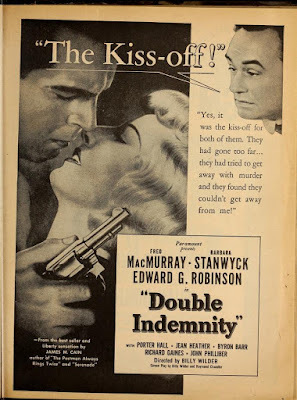 Double Indemnity, based on James M. Cain' s potboiler novel, follows Walter Neff (Fred MacMurray), a seemingly genial insurance agent who appears to have a pretty sweet life. Walter has a bachelor pad, a good job (he's up for a promotion thanks to his good buddy Keyes played by Edward G. Robinson), and he even has enough spare money to go out for the occasional round of bowling. Walter throws all this good fortune away for the ankle-braceleted charms of Mrs. Phyllis Dietrichson ( Barbara Stanwyck), a bored housewife who tells Walter she despises her husband (Tom Powers). Soon, Walter and Phyllis take out a life insurance policy on the unfortunate Mr. Dietrichson so they can get a large cash payout when he dies in "a train accident." Double Indemnity had a rocky path to the silver screen. Cain's novel, which was based on a sensational 1920s murder case, was considered so trashy that Wilder's screenwriting partner Charles Brackett refused to collaborate with him on an adaptation. 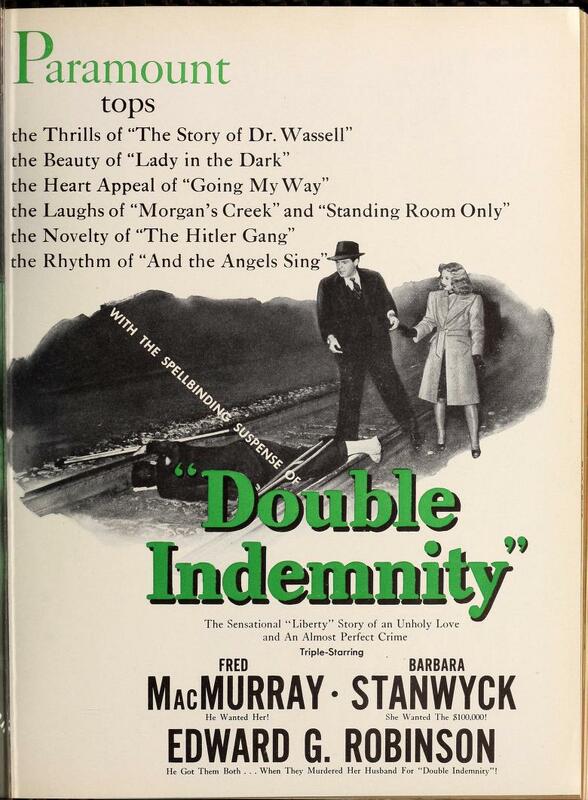 In fact, Hollywood's chief censor Joseph Breen objected to Double Indemnity before it was even published. 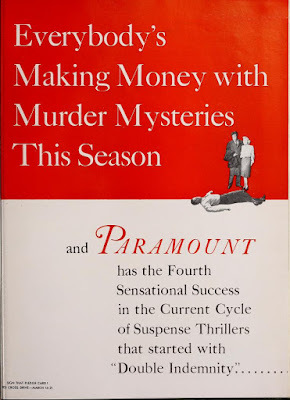 He warned MGM, which had acquired the rights to the unpublished novel, that Double Indemnity "was almost certain to result in a picture which we would be compelled to reject." Similar warnings were issued to Warner Bros. and Columbia Pictures before Paramount Pictures picked up the rights for Wilder's third film as director. Somehow, he and crime novelist Raymond Chandler hammered out a script that was acceptable to the Breen office, although the ever vigilant Breen demanded that Stanwyck, who is introduced wearing nothing but a towel, be properly covered up. The towel "should certainly go below her knees," Breen noted. Wilder also had a difficult time finding actors who were willing to play the dastardly duo of Walter and Phyllis. Stanwyck was always his first choice, but she was reluctant to take on the part of an unrepentant murder. Wilder finally won her over by challenging her acting skills -- "Are you an actress or a mouse?" he asked -- and Stanwyck turned in one of her best performances as a scheming femme fatale. Her man-trap ways and ice-cold demeanor set the template for many future femmes fatale. Wilder tried to get Alan Ladd and George Raft for Walter, but both turned him down (ironically, Ladd would go on to play many a noir anti-hero, while Raft was well-known for playing ruthless gangsters and was notorious for having organized crime connections). Wilder hit upon the perfect choice with MacMurray, an actor who was known for playing genial boyfriends and sidekicks. MacMurray gives the performance of his career as a sleazy insurance salesman who thinks he's a debonair ladies' man. Even today, MacMurray's performance can be shocking for those who are only familiar with his wholesome image from My Three Sons and Disney movies. This multi-page ad compares Ministry of Fear to Double Indemnity (1944). 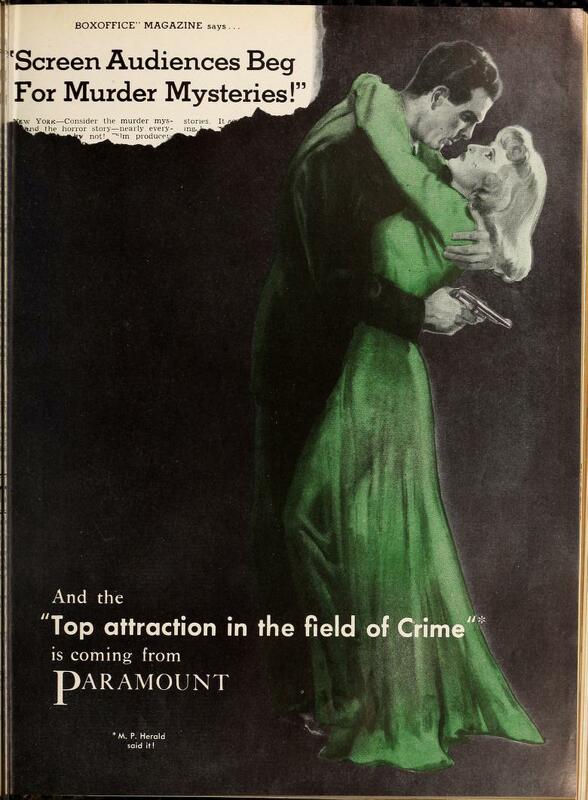 Once the movie was finished, the Paramount publicity department went all out with full page ads in trade magazines that blared, "Screen audiences beg for murder mysteries" and "Top attraction in the field of crime." Despite all the ballyhoo, Double Indemnity was unlike anything most moviegoers had ever seen. This "murder mystery" revealed the seamy underside of American life. 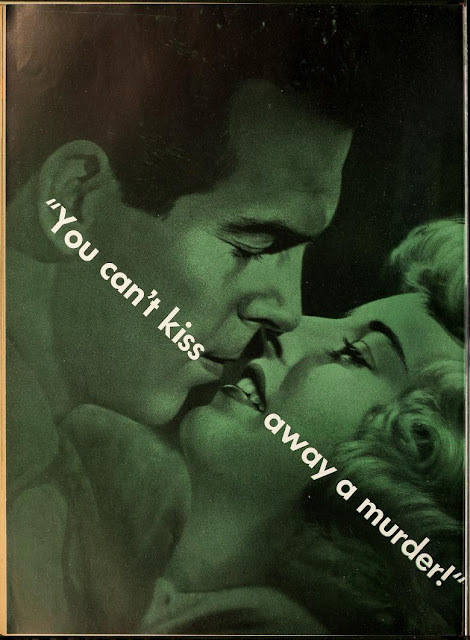 Double Indemnity portrayed suburbia as a place of insurance cheats, bored housewives, and murderers instead of the white picket fences of the Andy Hardy series. Double Indemnity was a huge hit that helped fuel the postwar boom in films noir. 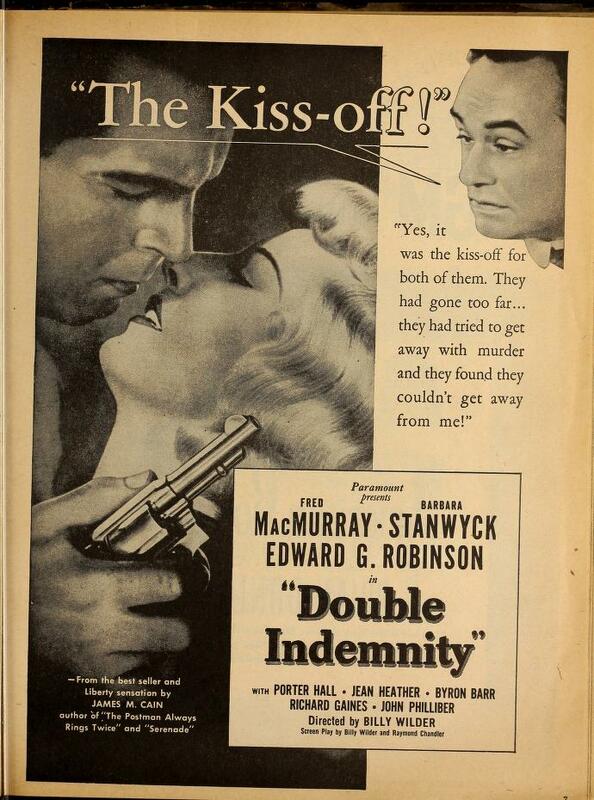 Paramount advertised other noirs by comparing them to Double Indemnity. 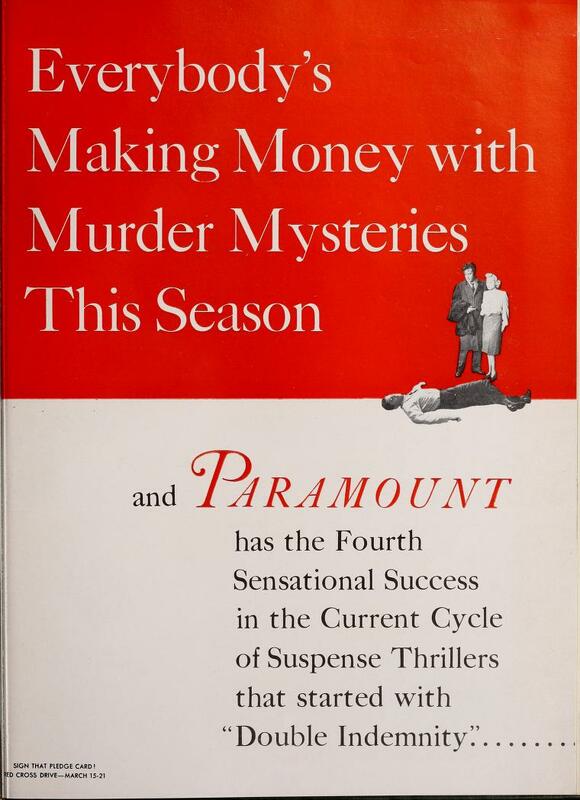 In ads for both Ministry of Fear (1944) and The Unseen (1945), Paramount portrayed itself as the leading studio for suspense films because of Double Indemnity. All the images are courtesy of the Media History Digital Library.